Midfield– Gerrard, Sterling, Coutinho, Henderson, Lallana, Markovic, Can, Lucas, Allen, Ibe, Suso – I am not going to call Suso and Ibe “surplus to requirements” so I can certainly see a loan spell for the two youngsters. (Truth be told, I’ve watched Jordan Ibe closely this preseason and I think he could have a breakout season, but that’s a story for another blog.) It’s true that one-third of this midfield has yet to prove anything wearing LFC colors, but I can see a role for each of these players this coming season. Is there room for improvement? Absolutely there is, but that is not the issue at the moment. If people are concerned about the squad’s depth heading into the season, I assure you that the likes of Lucas and Joe Allen in the midfield will be able to hold their own during the dog days of the Premier League in order to save the legs of a Steven Gerrard as we progress through the latter stages of the Champion’s League. They did it last season, so it would stand to reason they’d be able to do it this time as well. Forward– Sturridge, Lambert, Borini – so this is a clear need and like most of you I am desperately hoping for a big name to come to Merseyside before August 31. Surely Rodgers can tinker with the formation and throw guys like Coutinho or Sterling into the roles of pseudo-striker, but that approach won’t last very long especially when you consider the injury history of both Sturridge and Borini. But there is still more than two weeks to go before the transfer window shuts. We can throw our hands in despair on September 1st if nothing is done between now and then. It’s a concern, but surely not enough for any sane “expert” to think a club will fall three spots in the table as a result. Right? Back to the original question that I was attempting to address… Clearly depth was a huge issue last season and the biggest reason we lost the title race in my opinion. After the additions we’ve made thus far if these “experts” are going to try and sell me on the fact that our supposed lack of depth is going to carry over and cause Liverpool to slip a few spots on the ladder, I’m not buying. Neither should you. As for the second-most spewed-out reason for an inevitable Red demise next season, how will Liverpool cope with the lack of production created with the Luis Suarez departure? It’s another completely legitimate question. How would any team cope of the departure of one of the world’s greatest players? You simply can’t. But you can improve in other facets of the game. Suarez scored 31 goals in the Premier League last season. Let’s be conservative and say that his collective replacement nets only 11 throughout the season. If nothing else changes, then you could deduce that Liverpool will score about 20 fewer goals next season without Suarez (again that’s my fantastic advanced degree at work for your benefit). Instead of worrying about how to replace those missing goals, why don’t we instead focus on figuring out how to shore up the defense and let in 20 fewer goals. That seems like an easier task to me. 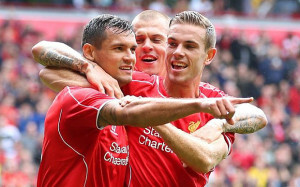 With the addition of Dejan Lovren, Alberto Moreno, and Javier Manquillo it would appear that Rodgers agrees. And let’s be honest, the defense last season wasn’t THAT bad in actuality. Martin Skrtel reinvented himself after a disastrous 2012-13 season. The discovery of Jon Flanagan a year ago was a huge bonus, and I’ve seen tremendous potential in French national team starter Mamadou Sakho. That’s not even mentioning vice-captain Daniel Agger who will be looking to do what Skrtel did last season. Now if we can just get Moreno up to speed quickly to limit the number of starts for Glen Johnson, but that’s also a story for another blog. For Liverpool to be successful, the mentality has to change. It can’t be the old Brazilian strategy of “we don’t care if you score, we’ll just score more.” Rodgers understands that. You can see it in the way the team played this preseason. Gerrard has been playing deeper than ever. He’s changing his focus to be more defensive while letting the younger legs take care of the attack. With this change in tactics and improvements at almost every position on defense, I see no reason that the Liverpool collective goal difference can’t remain the same as it did last season. Score 20 fewer goals, but let-in 20 fewer goals as well. And shouldn’t a similar goal difference translate into a similar point total at the end of the season? As we prepare to enjoy the beginning of the new season, I remind you to ignore what these “experts” say about our club. Forget about what other fans think. Just nod and smile coyly at their claims that we were just “lightning in a bottle.” Last season we damn near won the league when no one expected it. Now it’s time to do it again because like last season, no one will be expecting it. And when it happens, we’ll toast another great season and laugh as we scream at the top of our lungs those four fantastic words: “I TOLD YOU SO!!! !” On Sunday #WeGoAgain against Southampton! Come on You Reds! Three points await!